A single row of diamonds gracing the wrist is an elegant fashion statement all its own, and at SuperJeweler.com we have a variety of genuine diamond tennis bracelets, diamond line bracelets, diamond gemstone bracelets, sterling silver bracelets, white gold diamond bracelets, yellow gold diamond bracelets, 7 inch white gold tennis bracelets, as well as a vast selection of bracelets for men. A classic white gold round diamond tennis bracelet can provide an elegant and reliable diamond jewelry item that never goes out of style, and we know every woman will appreciate having such a versatile piece in her collection. If you’re looking for something a bit more distinctive, we also colorful blue diamond bracelets, gemstone and diamond bracelets as well as sterling silver diamond bracelets that provide the same look as white gold for a fraction of the price. Not only do we carry the best prices on white gold diamond tennis bracelets and yellow gold diamond tennis bracelets, but we have more sizes available than most online jewelers. A genuine diamond tennis bracelet is a hugely popular choice for our savvy, sophisticated shoppers, but we know that not everyone can wear a standard 7 inch diamond tennis bracelet. We always make sure to have plenty of sizes on hand, including 6.5 inch white gold diamond tennis bracelets, 7.5 inch yellow gold diamond tennis bracelets, 8 inch gold diamond tennis bracelets and even 9 inch genuine diamond tennis bracelets. We feature many 8 inch white gold diamond tennis bracelets and 9 inch yellow gold diamond tennis bracelets at sale and clearance prices as well, so you’re always assured we’ll have the size you need at a fraction of the price you would find elsewhere. Love the look of brilliantly colored gemstones combined with the white fire of diamonds? 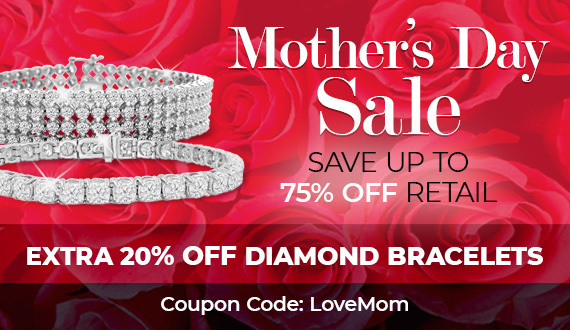 We have just what you’re looking for with our colorful selection of diamond gemstone bracelets, and these make wonderful birthstone jewelry gifts for that special someone. We have plenty of antique inspired yellow gold ruby diamond necklaces, sterling silver amethyst diamond necklaces, blue topaz diamond rope bracelets, white gold emerald diamond bracelets, antique white gold sapphire diamond bracelets, sterling silver aquamarine diamond bracelets and other gemstone diamond bracelets in every color of the rainbow. We also carry diamond charm bracelets, diamond heart bracelets, diamond cuff bracelets and gorgeous princess diamond line bracelets. Don’t forget about our mens bracelet collection, which includes 8.5 inch stainless steel bracelets, men’s stainless steel link bracelets, stainless steel ID bracelets for men, and stainless steel and carbon fiber bracelets for men. These stainless steel mens bracelets make wonderful anniversary or birthday gifts, and the special man in your life will definitely appreciate the lightweight functionality combined with the tough look of these mens carbon fiber bracelets. SuperJeweler is your premiere source on the web for cheap diamond tennis bracelets, white gold diamond tennis bracelets, yellow gold diamond tennis bracelets, 8 inch diamond tennis bracelets, 9 inch diamond tennis bracelets, sterling silver diamond charm bracelets, diamond gemstone bracelets and durable bracelets for men.